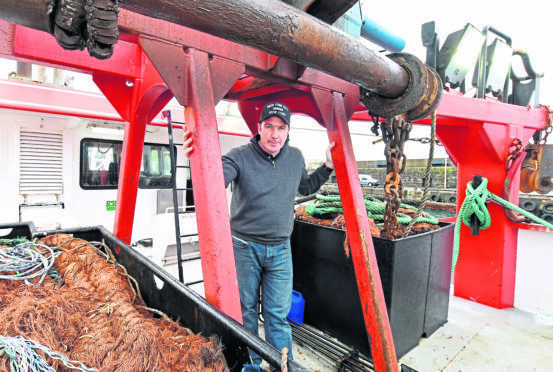 Fishermen have predicted a bright future for Macduff Harbour following a massive cash boost. Plans for a new ice machine were unveiled at the start of the year, with the aim of reducing the time and costs for local boats that currently travel to Fraserburgh for ice. Now the council has secured £376,000 from the European and Maritime Fisheries Fund (EMFF) to go towards the new quayside complex. The remainder of the cash for £400,000 development will come from the local authority’s regeneration reserve funds. Last night skipper John Clark, who owns and operates the trawler Reliance II out of Macduff, said it could lead to the town’s harbour becoming a lot busier. He said: “It’ll increase the landings coming in at Macduff. “Boats will be able to come in, get ice and go out to sea again so it will be a huge benefit for Macduff. “It’s very good for this corner of the north-east. Duncan Mason, who fishes with a creel boat from Macduff, said the new facilities would be a “big advantage” to the town. And harbourmaster Duncan Mackie said the development means the port will be more attractive to boats returning from sea. He said: “We are trying to create a one stop shop to provide all of the facilities here at Macduff. “It is so boats can come in and land their fish, get some ice and go back out to sea. “It will be a gradual process but we will be busier than we are now. Fisheries Secretary Fergus Ewing announced the funding for the Macduff project at last week’s Skippers Expo in Aberdeen. It was among more than £6.9million pounds in Scottish Government and European Union funding grants handed out to the fishing industry. Last night, a spokesman for Aberdeenshire Council said: “This grant is essential to allow this project to proceed, so it is very welcome. “In conjunction with money from the council’s regeneration fund, this facility will make the landing of increased numbers of fish at Macduff more viable for the fishing industry. A contractor has been appointed to the project and once all of the necessary equipment has been delivered it is expected to take four weeks to build. The complex would include a conveyor belt to move ice onto waiting fishing boats, be able to store 10,000 litres of water and 10,000 tonnes of ice.